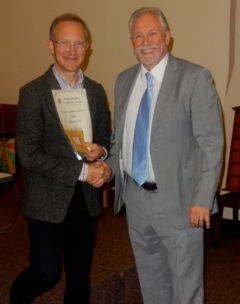 The Society received a large number of applications for the Goodliff Awards scheme this year and our President Dr Simon Thurley was pleased to present the awards for 2015 at the President Lecture on 15th October. 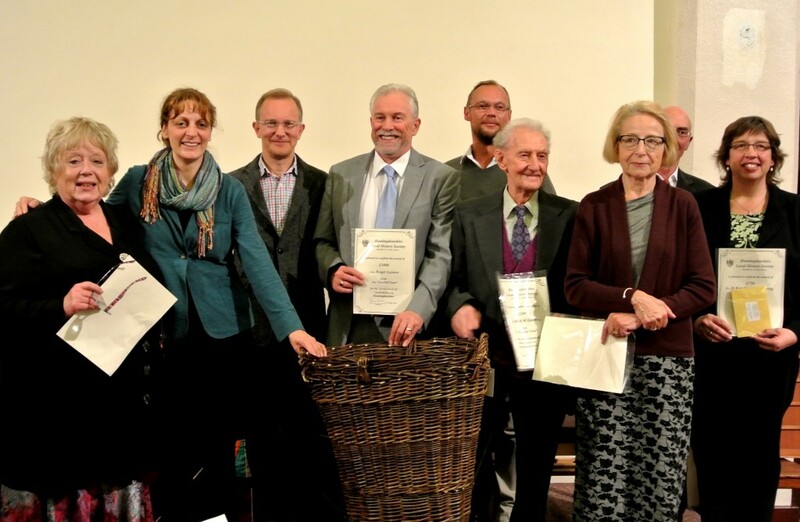 Pictured from left to right, Kate Hadley, Gilly Vose, Dr Simon Thurley, Roger Leivers, Jason Peters (back), Bert Goodwin, Vivien Hoar, Roger Mould (back), and Antonia Pounsett. Mr H.W. (Bert) Goodwin. Mr Goodwin has been researching, collating and transcribing early wills and inventories (1505 to 1828) of St Ives residents that he has discovered in the Huntingdonshire Archives, Norris Museum and other local sources. These documents often difficult to read and decipher have been transcribed into modern readable documents that will be stored electronically and in paper form and these will be made available for others to use. 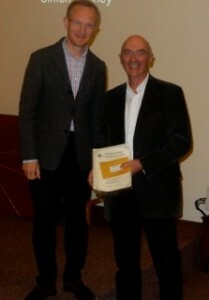 He was awarded £200 to help with the publication of his extremely valuable work. Kate Hadley. Godmanchester and the surrounding areas are steeped in Iron Age, Roman and post Roman history with huge numbers of artefact being on public display and also held in private collections. Although those artefacts that are held in our local and national museums are often well documented and catalogued, there are still many more that are in private collections with many not being adequately catalogued. Kate has amassed information on over 200 Roman artefacts that are held in private collections in Huntingdonshire alone. She has embarked upon the herculean task of compiling and photographing them which she intends to put into an illustrated digital catalogue for the first time. Once compiled this catalogue will be made available for public release with the aim of preserving these items for our current and future generations. 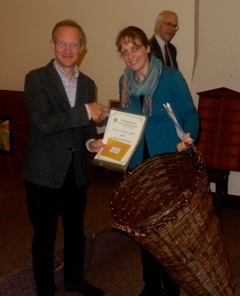 The Society is pleased to award Kate £1,200 for the creation of an illustrated catalogue of Roman artefacts from Godmanchester and Huntingdonshire. Vivien Hoar (Cambridge Gardens Trust). 2016 is the 300th year anniversary of the birth of Lancelot (Capability) Brown the renowned landscape architect and designer. The Cambridge Gardens Trust is preparing and publishing a tour guide leaflet of places in Cambridgeshire and Huntingdonshire associated with Lancelot ‘Capability’ Brown. This leaflet, to commemorate the tercentenary of Brown’s birth, is to be made freely available following publication at the Cambridgeshire Gardens Trust AGM, Autumn 2015. The Society is pleased to award the Cambridge Gardens Trust £422 for publication of the tour guide leaflet. Roger Mould (Warboys Local History Society) The Warboys Archaeological Group in conjunction with Jigsaw Cambridge has been carrying out an excavation at Warboys Manor House. One of the more interesting finds was a mid 17th Century building which was most likely a cold storage house associated with the fishing industry. The Society is pleased to award the Warboys Local History Society £500 for cost of identifying bones and artefacts from the site and for publication of a report of its Archaeology Project excavations at Warboys Manor. Norris Museum, St Ives (Gilly Vose). The Norris Museum is undertaking a major redevelopment and expansion of the museum being funded by a significant Heritage Lottery grant. A part of that development will be the creation of new wing that will be a permanent gallery about the museum’s founder Herbert Norris, who was a well-known local jeweller and a renowned amateur historian. Norris amassed his own personal collection of archives, rare books, paintings, natural history exhibits and archaeological artefacts about Huntingdonshire which formed the basis of the museum’s current collections. The museum are planning to recreate an area as Herbert Norris’s study using interpretation, original furniture and artefacts based on original photographs. Their aim is to explain the interesting story behind the museum, the important Huntingdonshire material Norris collected and explore the role of Victorian and Edwardian collecting in society. The Society is pleased to award the Norris Museum £1,000 to help fund part of the creation of the replica of Herbert Norris’s study. Norris Museum, St Ives (Gilly Vose), Learning about the Stone Age and the Iron Age is now part of the National Primary Schools History Curriculum and the Norris Museum is ieally placed to help schools teach this time period having such a strong collection of prehistoric archaeological artefacts. The Norris has experience of developing learning programmes, including outreach activities that can be used by local schools and children in their exploration of our rich historic past. The Society is pleased to award £635 to the Norris Museum to help towards the creation of a teaching and learning package for loan to schools on our rich and diverse Stone and Iron Age past in the Huntingdonshire area. Roger Leivers. During World War Two Huntingdonshire was dotted with many RAF airfields that were the home of Bomber Command and USAF aircraft and crews. Roger has spent many years researching one of these aircraft, a Stirling Bomber of Number XV Squadron, that sadly crashed onto Godmanchester in 1942. Roger concentrated his research on the crew, some of who lost their lives in the crash and their families and decedents. In 2014 he successfully brought a number of the dependents of the crew and some surviving bomber crews together at a reunion memorial in Godmanchester. The crew of Stirling N.3703 were based at RAF Wyton but the aircraft because was being operated from RAF Alconbury because of runway restrictions at RAF Wyton. The aircraft took off from RAF Alconbury on 10th April 1942 and the crew flew a successful mission dropping their bombs on Essen in Germany. Unfortunately the aircraft was badly damaged by flak over Essen but the crew were able to coax the aircraft back to Britain. Sadly, at 4:35am on 11th April 1942, just minutes from home the aircraft crashed into a field near to Rectory Farm, Godmanchester, killing some of the crew. The Society is pleased to award Roger £1,000, to help with the publication of a book on the flight and crew of the Stirling N.3703 of XV Squadron. Jason Peters. Jason has been researching the existence of ancient and sometimes now extinct forests in Huntingdonshire with the aim of collating all of the information into a single document and digital records. A lot of our ancient forests and woodlands are now lost under the explosion of agricultural in the middle ages and more recent times to support the ever increasing population. It is key to record how our countryside has changed over the centuries and Huntingdonshire may be the first county to have its forest history documented in such a manner. The book will cover the Royal Forest and Haga (Anglo Saxon) of Sapley, Hartford, Stukely, Royal Forest and Haga of Weybridge, Brampton and Alconbury, Hartha and Buckden. 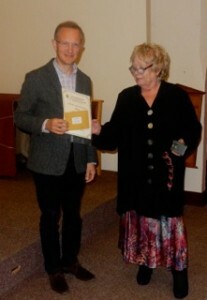 The Society is pleased to award Jason £1,050, for the production of a book/CD on the Forest history of Huntingdonshire. Antonia Pounsett (St Kyneburgha Building Preservation Trust) The Lower Nene Valley was a major area of settlement during Roman times with key towns such as Godmanchester and Durobrivae, near Water Newton, just north of present day Peterborough. Antonia has been researching the finds from many digs at Durobrivae and has been documenting the links that this town had with others in modern day Huntingdonshire and Northamtonshire. 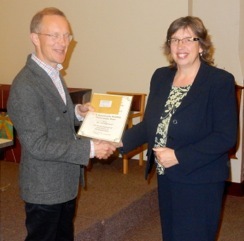 The Society is pleased to award Antonia £750 for publication of an illustrated guide to the Romans and their settlement of the Lower Nene Valley, giving a picture and narrative about the people, their lives and the impact and influence of the town of Durobrivae on Ermine Street and other settlements such as Godmanchester. Dr Chris Thomas. Following his discovery of a ‘lost’ envelope which contained a sample of mammoth hair in the archives at the Norris Museum, his research led him to discover that the sample of hair was strongly linked with the Berezovka mammoth in the Museum of Natural History, St Petersburg. In 2014/2015 he put on a very interesting and successful exhibition explaining his research, entitled Marvellous Mammoths, Norris Museum in St Ives. He has now published a booklet, ‘Marvellous Mammoths’ which is all about Mammoths, Neanderthal and human life in Huntingdonshire. 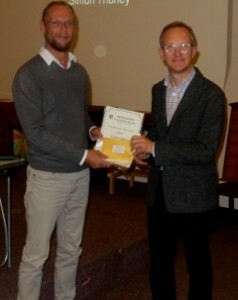 The Society was pleased to award Dr Thomas £413 to help with the cost of publishing his booklet.